The FXive project aims is to provide a functional sound design web service for film, television, games and virtual reality suitable for both novel and expert sound designer. I had the pleasure to contribute to the FXive through a five months internship carried out within my Media & Arts Technology PhD research. My work focused on three main area of research: procedural audio, sound design and web audio development. More specifically, the work carried out aimed to improve and enhance the FXive project in relation to three specific aspects: (i) new audio effects design, (ii) sound quality improvement (iii) graphical user interface improvement. Fire Ball pass by - juxtaposing whoosh and fire. Arrow Impact - concatenating richochet, rapier on metal, bouncing and whoosh. Match Strike - concatenating cabasa and fire. Geyser - juxtaposing rain, drop and bouble. Flame Thrower - juxtaposing whoosh, fire, electricity and fan. Open Bottle - concatenating shaker, whoosh and stream. Knife Chopping Vegetables - concatenating switch, whoosh and sword. Axe Chopping Wood - concatenating gun, hammer, whoosh and sword. Sci-fi effect - juxtaposing hammer, electric motor, rocket, axe on metal, DC-motor, explosion and fire. Magic spell - juxtaposing rocket, whoosh, thunder, fire and light saber. Here it is possible to review the results obtained. These sounds were designed by consider the FXive audio models as basic elements that, combined with each other, could be used to constitute new and complex audio effects. 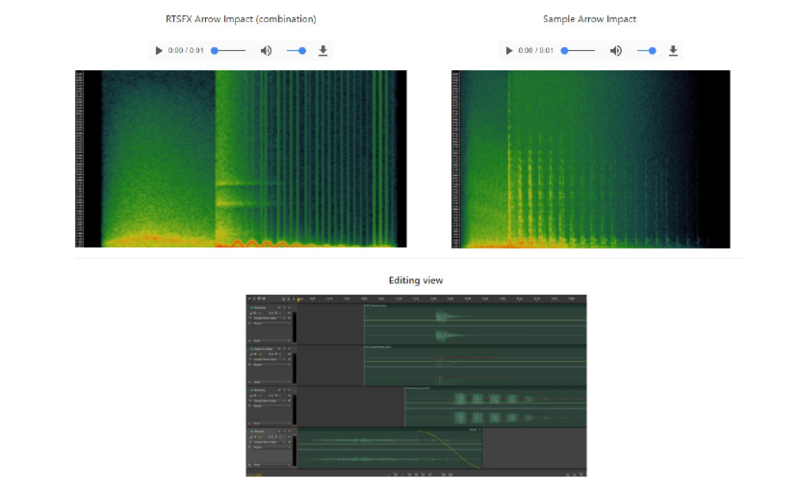 The strategy identified for the evaluation of the sound material delivered by the RTSFX service, involved the comparison of specific audio modules with analogous high quality samples. A systematic analysis therefore permitted to individuate similarities and differences amongst the two sonic categories. A web page for the collection and sharing of this material as well as comments and suggestions on possible adjustment to the audio modules has been created. It is possible to review the documentation developed here.